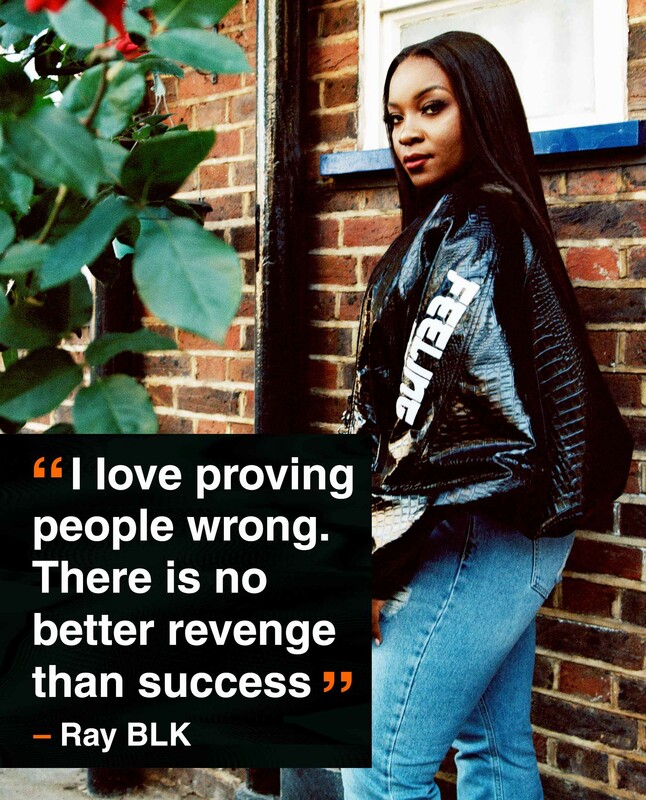 Born in Nigeria and raised in South London, Ray BLK’s music mixes street smarts with a message of empowerment for her fans. Her eight-track ‘Empress’ project is an empowering statement of intent, but she has world-beating mainstream success in her sights, she tells Jordan Bassett. Ray BLK was 14 the first time she saw a gun. It was at a house party in Catford, south London, where she grew up. She wasn’t even supposed to be at the party. Her mum was strict, so Ray lied about where she was – something she only ever did twice in her teens. “Being somewhere I wasn’t even supposed to be in, and then someone bringing out a gun… I was like, ‘Oh – this is exactly why I’m not allowed out of the house,’” she says today with a bright, bemused laugh. An argument between two boys resulted in one producing the weapon. “Where I’m from, kids see and hear about a lot, so stuff like that doesn’t really shock me”, she says. No-one was hurt – “everyone got out of the house” – but the incident, and countless stories like it, clearly left a mark. In August, Ray released the dystopian music video for ‘Run Run’, a pulsing R&B track that tackles the rise in knife and gun crime across the country. “Run run if you wanna see the sun”, she sings, “We don’t wanna lose another one.” Meanwhile, a young man is chased across a bleak cityscape, evading armed opponents, before he’s captured and a number is painted across his chest. It’s a powerful, clear allegory, imploring young people not to become a statistic, and indicates the strong seam of social conscience that runs through Ray’s work. ‘Run Run’ is the opening track on the lushly produced ‘Empress’, the stunning eight-track ‘project’ Ray released last Friday (October 26). It’s an uncompromising way to introduce a record that – much like the singer in person – deals with difficult issues with a lightness of touch that makes it easy company. In her four-star review of the record, NME’s Kyann-Sian Williams wrote that “‘Empress’ is an important public service announcement to all the ladies out there, a reminder that they are powerful, strong and have the power to do anything with their lives”. Set in the mould of classic R&B (Lauryn Hill is a key influence) it’s a proud, triumphant collection that glimmers with stellar hooks and stylistic flourishes – see the twinkling sounds effects that chime like Mario coins on ‘Paradise’ – switching between moments of introspection and bouncing, upbeat soul-pop. The jubilant ‘Got My Own’ is a sort-of ‘Independent Women, Pt. 1’ for 2018 (“I don’t care about the price / Baby I can buy it twice”), so catchy that it already sounds classic. Ray BLK first made waves with ‘My Hood’, 2016’s Stormzy collaboration on which she champions “full English breakfast at a caff, not a café”. When NME meets her in Deptford, the rapidly gentrifying south London borough in which she’s recently bought a flat, the venue is definitely a café, not a caff; the place doubles as – of course – a fancy bike workshop. It’s the day after her record launch at YouTube’s swish north London studio, an event for family and fans – a celebration of all that ‘Empress’ represents. She performed four songs and took questions from the audience, while visuals artists doodled on enormous sketchpads around the venue. The atmosphere was distinctly wholesome, feel-good, supportive. A month before her NME interview, Ray attended a talk at Baylis Technology school in Lambeth, south London. This was part of the musician’s Just A Kid campaign, a set of panel discussions held at London schools – including Ray’s own former stomping ground in Bromley – and intended to inspire young students. At Lilian Baylis, she was joined by rapper Not3s, who achieved viral fame with the ludicrously catchy ‘Addison Lee’ back in 2016; between them, the pair incited the level of excitement you’d readily expect when pop stars cross the school gates. They reminded the pupils that social media isn’t real life (“Trolls lives under a bridge for a reason,” Not3s noted sagely) and that a lack of representation in the media – there was one white student in the audience – doesn’t mean that they don’t belong in the top tiers of society. One student asked, “You know how people doubt you and say, ‘You’re not going to make it?’ What has kept you continuing your dream?” Ray’s response caused a collective, appalled gasp to swell across the hall. When she flicked her hair and said, with a laugh, “I saw him at the MOBOs the following year when I was nominated and was like, ‘Oh – hi!’,” that appalled gasp was replaced with a round of applause. 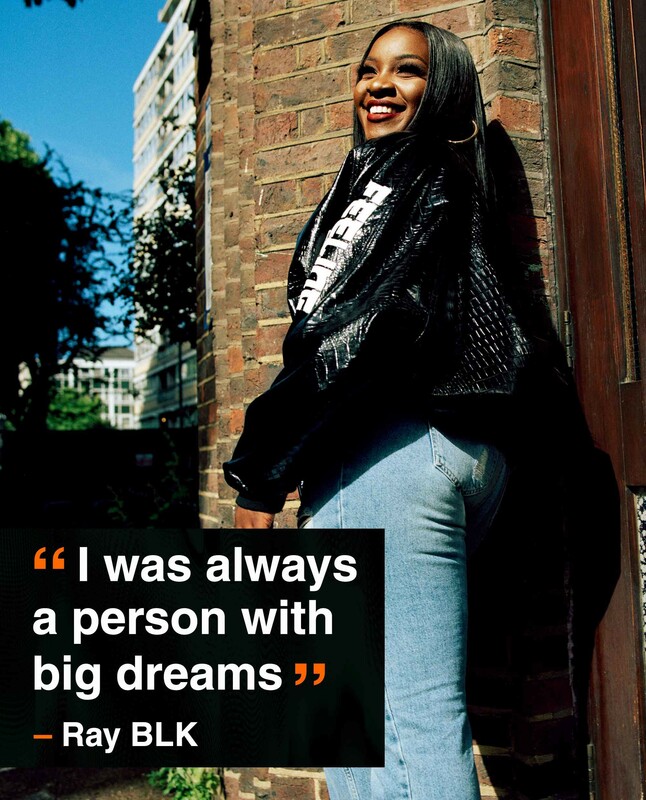 Ray BLK was born Rita Ekwere in Lagos, Nigeria in 1993 and moved with her family to south London when she was four. She was brought up by her mum, who instilled in her a penchant for hard work, shielding her from neighbours and schoolmates she perceived as a bad influence (Ray pays loving tribute on the emotive, soulful ‘Empress’ track ‘Mama’, a recent single). She studied English Literature at London’s Brunel University, after which she bounced between random jobs – a stint in PR; folding clothes at Selfridges; even a brief foray as a guide on a London tour bus, though she would often make up the anecdotes and facts – before she uploaded a handful of promising tracks on Soundcloud and landed herself a manager. 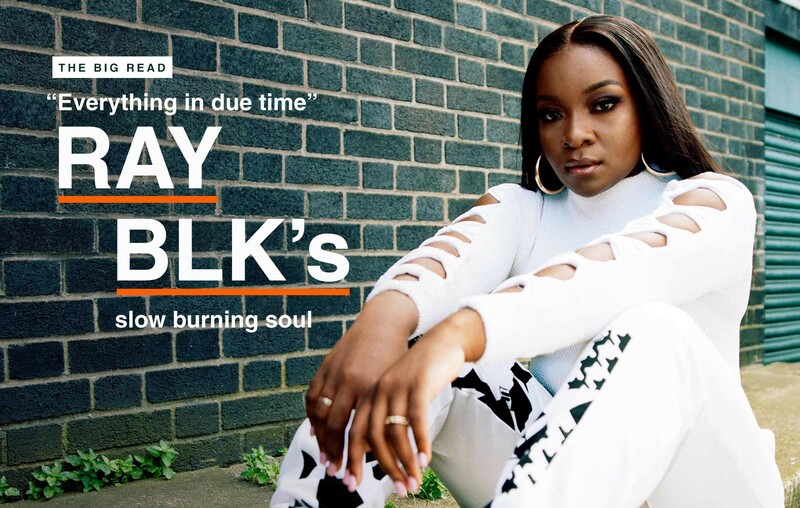 Last year, Ray BLK topped the BBC’s Sound Of… poll, an emerging talent gong previously awarded to Adele and Sam Smith, and next year will release her first full-length album through Island Records. So much for staying behind the scenes. Does she know where that person is these days? She paid homage to trail-blazing mid-noughties garage legend Miss Dynamite at the Just A Kid session, and today is dismissive of the suggestion that perhaps the musician hasn’t received her due in the collective memory of the mainstream. Dynamite appears on ‘Empress’, imparting spoken-word wisdom at the conclusion of final song, the fittingly titled ‘Just A Kid’: “There’s so much pressure out there, but it’s a new day – and you are the new day; you are the gift.” What did it mean, after all these years, to have her hero on her record? That last sentence could be Ray BLK’s motto. Her path to success is a slow burn, and the flames are only just beginning to rise. ‘Empress’ is an assured statement of intent, an assertion of her sense of self, while next year’s album will be a poppier affair – a bid for ubiquity, perhaps. 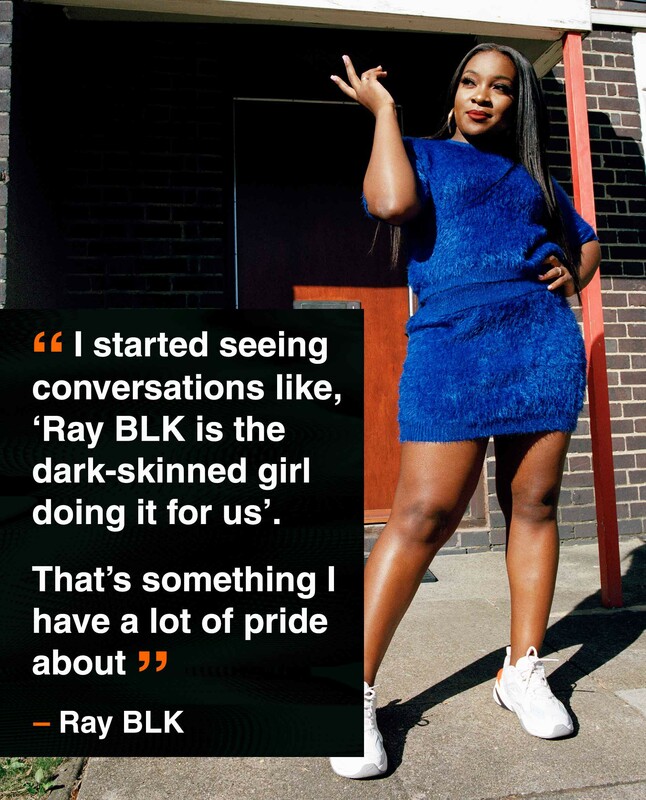 Having turned up to her NME interview in cat-eye shades, sipping a much-needed Lemsip like a Martini, Ray BLK spends the hour being as wise and funny as a bonafide star. It doesn’t come as much surprise that when we’re wrapping up, her stylist turns up with a suitcase stuffed with glam threads. A black-and-white photograph of Ray and Not3s, taken at the Lilian Baylis talk, adorned the wall as the band bounced through her music (she visibly cried onstage in the middle of ‘Paradise’, which she dedicated to a friend who’s died). For the encore, Ray returned to raucous applause to roll out ‘My Hood’, her breakthrough hit, a celebration of staying grounded. Afterwards, she disappeared offstage, leaving the band to play on, her presence still felt. It was a classy piece of stagecraft worthy of the A-list superstar Ray BLK deserves to become. But everything in due time.